On several core issues I've noticed that establishment Republicans are out of step with the Show Me State's Tea Party activists. After some tough electoral losses earlier this month, St. Louis Tea Party co-founder, Bill Hennessy blogged about the fact that the Missouri GOP has become more of a club than a political party. Nowhere is that clearer than in Jefferson City, MO. In early March Missouri State House Speaker, Steve Tilley, indicated that the pending right to work legislation was not a priority. It's still languishing in the legislature. Earlier this week Republicans circled around to shoot their own. State Senators Jim Lembke (R), Brian Nieves (R), Will Krause (R), and Rob Schaaf (R) worked out a deal to impose some fiscal discipline on the federal government, but State Senate Appropriations Committee Chairman Kurt Schaefer (R) may derail their efforts. Tea Party criticisms of the education reform bills pending in Jeff City have also fallen on deaf ears. 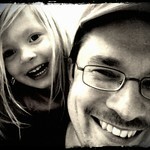 The leading voice on education within Missouri's Tea Party movement is Gretchen at www.MissouriEducationWatchdog.com. She's pointed out that federal blueprints like Race to the Top and Common Core State Standards erode the authority of local school boards by ceding power to Washington, DC, in exchange for federal funds. In essence, the state legislature agrees to more Federal control over education and the state gets Federal money in return. Whether the issue is education or agriculture, this is how state sovereignty is lost. Gretchen has also criticized the longitudinal data system as an intrusion into the privacy of children and their parents. Does the government in DC, really need to track the income of a student's family or other private data? One reason that our Republican legislature is out of step with Tea Partiers is that the legislative leadership is composed of the old guard. Like many states across the country, Missouri has a large class of freshman Republicans many of whom were Tea Party candidates. However, the leadership consists of establishment Republicans because seniority is a deciding factor for those leadership races. While some legislative leaders may identify with the conservative values espoused by the Tea Party, many do not. The fact is that Missouri's Tea Party freshman were rolled to elect Republican leaders to the left of conservative Tea Party principals. That has created fissures between grassroots conservatives and the establishment. One of those fissures split open in late February when Gretchen was attacked in The Culpeper Press for her work on education (see the clipping below). The Culpeper Press is a monthly print publication that has taken the establishment's line on education issues, even though it touts itself as a conservative, 9-12 newspaper. One odd thing about the attack on Gretchen is that it comes from an anonymous source in an unsigned article. 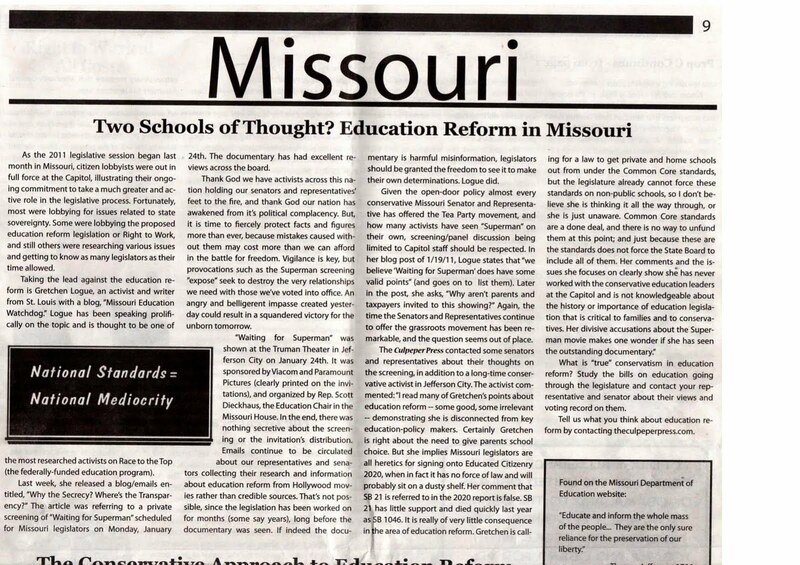 The article chides Gretchen for drawing attention to the fact that Missouri legislators and lobbyists attended a private screening of Waiting for Superman. Perhaps the unknown authors of that piece hoped to smear Gretchen as unreasonable by implying "it's only a movie", but we have since learned that the relationship amongst education legislators and lobbyists extends beyond an evening out. Private meetings on education seem to be common in Jeff City and muddled thinking is similarly abundant. While stepping for the high ground The Culpeper Press stumbled when it scolded: "An angry and belligerent impasse created yesterday could result in a squandered victory for the unborn tomorrow." The writer must be unaware that victory for the unborn was squandered when a man in the pocket of the human cloning lobby, Steve Tilley, was elected Speaker of the Missouri House. Tilley received $20,000 from Supporters of Health Research and Treatments on 10/6/2009 and another $30,000 on 1/4/2010. He also received $50,000 from Life Sciences Fund on 6/25/2009 (h/t Missouri Ethics Commission). Tilley had no reason to spend any of that $100,000 in the 2010 election cycle since he was unopposed in both the primary and general elections; therefore, it remains available to his campaign committee for future races and as an enduring embarrassment to The Culpeper Press.